Igra v adu / Aleksei Kruchenykh et al. Saint Petersburg, 1914. 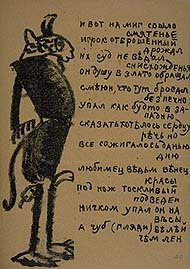 Poems by Aleksei Kruchenykh and Velimir Khlebnikov; illus. by Kazimir Malevich and Oliga Rosanova. 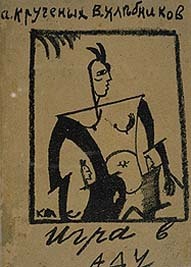 One of the representative publications of the Russian Avant-garde movement. The first edition appeared in Moscow in 1912. The second edition, which the Library owns, was published in Saint Petersburg in 1914. The latter edition, quite different from the former in binding and illustrations, has further additional 292 verses. This is a collaborative poetic work by Aleksei Kruchenykh and Velimir Khlebnikov, acting as central figures of the Futurists in the beginning of the 20th century. The text describes a card game between devils and sinners in hell. Printed in lithograph. This work is said to have pushed the authors to the utmost limits on their attempt of "zaumnoe yazik "(language beyond the meaning), where they focused on the sound effect of the words while ignoring the meaning. This second edition is illustrated by Kazimir Malevich and Oliga Rosanova. The former, in particular, was one of the pioneers in the Russian abstract paintings and highly evaluated for his influence on the paintings of the 20th century. This book has 26 illustrations of the two artists. This is one of the meterials, now owned by the Library, which Prof. KATAGAMI Noburu (1884-1928) collected in Russia, where he was dispatched in 1915 by the University for its preparations of establishing the Russian Literature Major. Artistic movement originated in Europe during the First World War. Denying and trying to destroy the existing ideas or schools, it tried to build a new direction. A group of writers and artists in the Russian Avant-garde movement. They aimed at destroying all the existing cultural traditions. Concerning poetics in particular, the Futurists' attempts include fundamental changes in the function of poetic languages. Copyright © Waseda University Library, 1996-. All Rights Reserved.